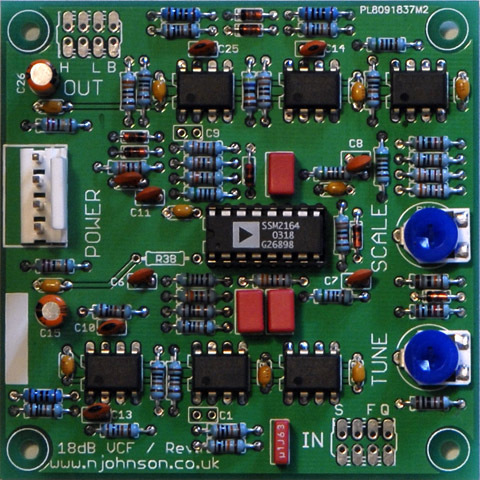 I build a three pole state variable filter PCB from Neil Johnson which uses the Analog Devices SSM2164 quad VCA. This filter has very nice low pass characteristics. The band pass becomes interesting when you add resonance. I didn't think the high pass would be that interesting but it really comes alive if you add resonance and use inverted envelopes. I changed the resonance operating range to 5 volts by changing R18 to 49K9 and used the spare op amp to generate a 5 volt reference for the Freq and Res controls. I sum the additional Freq and FM control voltages to IC5A pin 2. I first built a 2U version and added a Res jack normalled to +5 volts to allow manual control which is overridden by an external input. I later rebuilt the module in a 1U format. 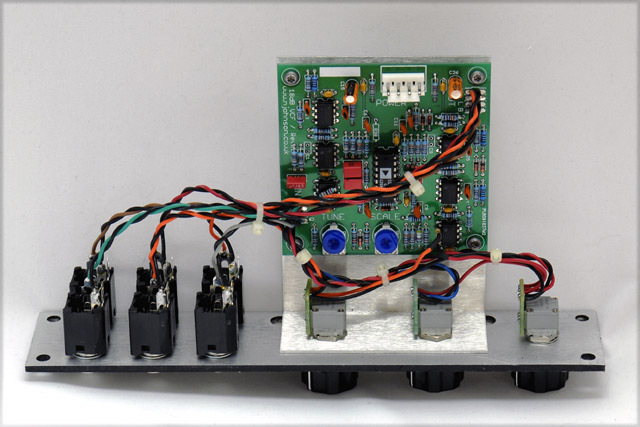 Here are 1U and 2U panel designs for the filter. Note that both images are actual photographs of the panel made by gluing a laser print of the FPE design to an aluminum panel and lightly coating with lacquer.